Website builder WebWave CMS allows you to secure chosen subpages with a password, so only signed in users can access them. 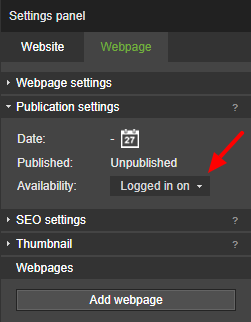 In order to allow access to a subpage to signed in users only, in Settings Panel enter Webpage settings and go to Publication settings. Change availability to "Logged in only". If a user who isn't signed in will try to access this subpage, Login window will be displayed. If you want to allow users to sign in/sign out and create accounts on your website, use Login element (read more).